South West Sydney Rockets Roller Girls Set to Roar! SWSR Roller Derby league were excited to be asked to have a feature in the sports section of one of our Local newspapers "The Liverpool Leader" this month about our new Roller Derby league "SWSR". We are currently recruiting new skaters to join our league and to start there fresh meat Training with us now! Fresh Meat Recruitment will continue until the end of the year. All new members are welcome regardless of there skating ability. If you have the right attitude, love to skate and want to have fun and get fit, are 18+ and live in the South West Sydney region of NSW (Liverpool, Campbelltown, Camden, Bankstown, Hoxton Park, Fairfield and surrounding areas) why dont you get your skates on and Join up with the SWS Rockets now!! 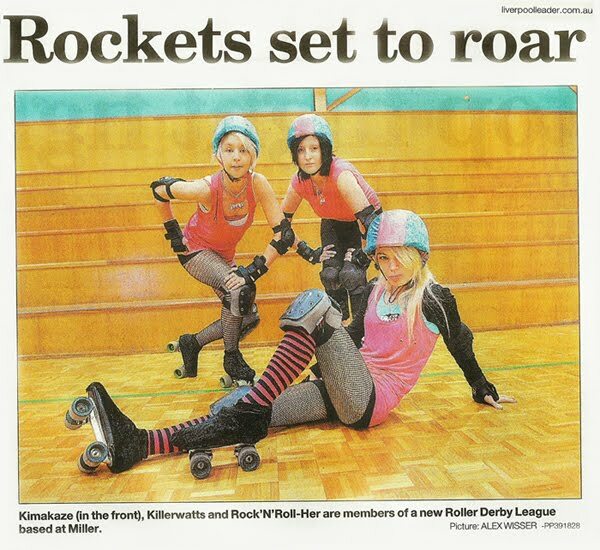 To read the full article in the Liverpool Leader on the SWS Rockets Roller Derby League, click here to go there now !